I got this little gem from 'Poems Aplenty', wow the utter rot you can publish on the world wide web is boundless. Fun, new experience or a tragedy? But would they have changed the result? Wow deep. For more trite click here, for poems on abuse, death, depression, hate and more chirpy rhyming couplets. This post is elephant inspired as a lovely blog follower is keen to get her hands on a brooch that never forgets ... So i have been making some little trunkers and here is the result. If any of these take your fancy let me know and I'll mail him out to you (elephant devotee blogger Bev). This morning must have been the most beautiful morning of the whole year, I love spring, but unfortunately that means summer is nearly here ... Brisbane summers are worse than having a prickle in your undies in a supermarket queue. O, your house sounds enviable! I am so sorry...I forgot to say THANK YOU...for the lovely heart-shaped brooch that I won from you. The elephants are sweet. Damn Summer prickle. Winter got the short end of the stick this year and Spring pushed it's way to the front of the queue. Brisbane Summers are full of prickles, flies and sweaty nights and I am not looking forward to it. Today at the Gold Coast feels too much like Summer. I think it is 30 degrees today. Elephants can really inspire by the looks. Very cute. Love it!, next time I see you I want an elephant pin, Rose tells me she wants one to. See you soon. Love the Prickle in your undies....very funny. 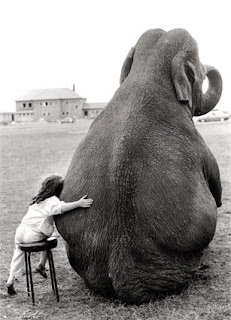 'Wish I had a Big Pal like that!